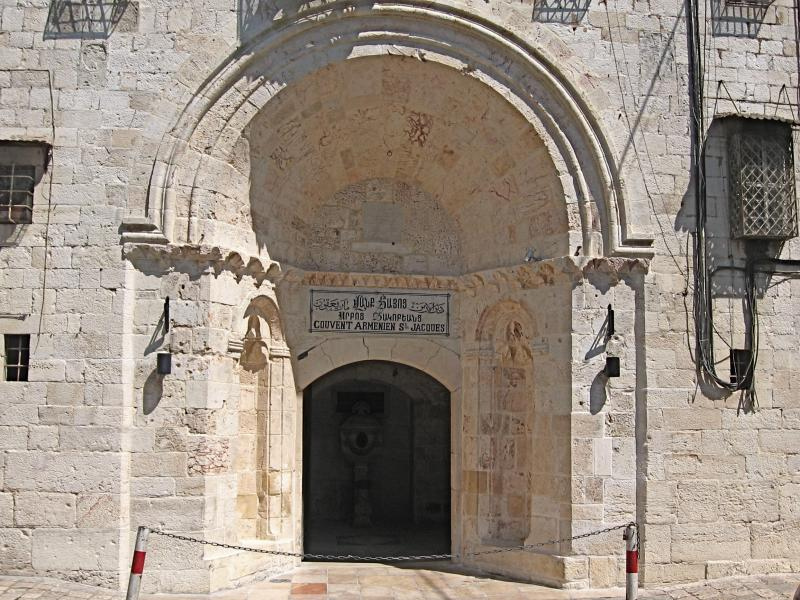 The Church of St Mark is home to one of Jerusalem’s smallest and oldest Christian communities, but it is the setting for a remarkable set of traditions — including the claim to be the site of the Upper Room of the Last Supper. This hard-to-find Syriac Orthodox church is in the north-eastern corner of the Old City’s Armenian Quarter, on Ararat Street which branches off St Mark’s Street. Its worship employs the oldest surviving liturgy in Christianity, based on the rite of the early Christian Church of Jerusalem. The language used is Syriac, a dialect of the Aramaic that Jesus spoke. St Mark (also known as John Mark) came from Cyrene in Libya. He became a travelling companion and interpreter for St Peter, and used Peter’s sermons when he composed the earliest of the four Gospels. 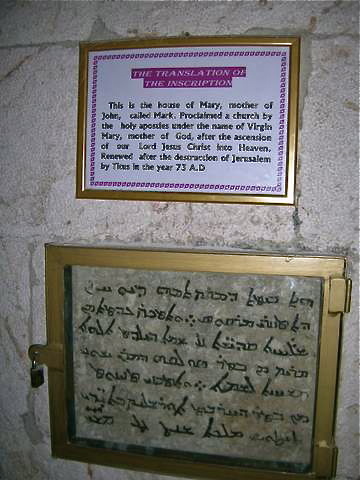 Mark’s mother, Mary of Jerusalem, had a house where members of the early Church met. It was to this house that Peter went when an angel released him from prison (Acts 12:12-17). The Syriac Orthodox believe the Church of St Mark is on the site of that house — a belief supported by a 6th-century inscription discovered there in 1940. Post-Resurrection appearances of Jesus to the disciples, including the one in which he showed doubting Thomas the wounds in his hands and side (John 20:24-28). While there is oral tradition to support these claims, scholars generally accept that the Upper Room was on the site of the Cenacle, near the summit of Mount Zion. Another Syriac Orthodox tradition holds that the Church of St Mark is at the place where Mary, Jesus’ mother, was baptised. A baptismal font purportedly used can be seen inside the church. 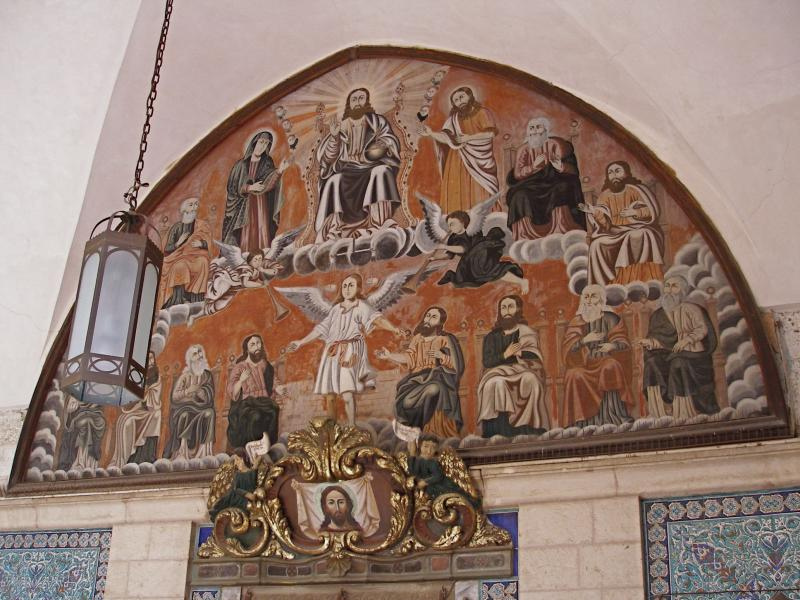 The church also displays a painting on leather of Mary and Jesus. It is said to have been painted by St Luke, but experts date it to the early Byzantine period. 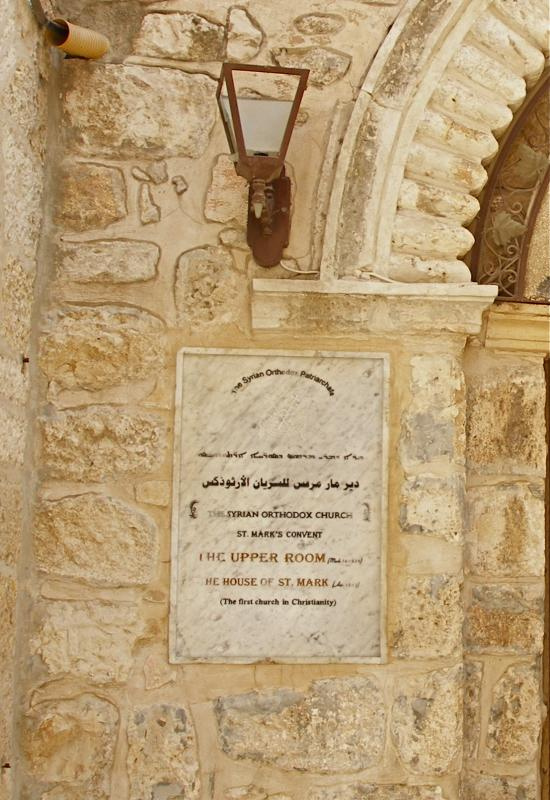 A notice beside the door proclaims the Church of St Mark to be “The first church in Christianity”, in the belief that it is on the site of the original house-church of Jerusalem’s early Christians. The interior of the church is dark, but the decoration is ornate. The sanctuary is richly embellished, though often partly hidden by a curtain representing the veil in the Temple. The present church was built in the 12th century over the ruins of a 4th-century church. Steps lead down to a crypt, believed to have been the lower floor in the house of Mark’s mother. The Syriac Orthodox Church claims St Peter as its first patriarch, in Antioch in AD 37. The word “Syriac” is not a geographic indicator, but refers to the use of the Syriac language in worship. Syriac Christians see themselves as the first people to adopt Christianity as natives of the Holy Land. At the time of Christ, the Roman province of Syria included today’s Syria, Lebanon, most of Palestine, and parts of Jordan and Turkey. Often called “Jacobites” (after an early bishop), the Syriac Orthodox form one of the Oriental Orthodox churches that became separated from the mainstream of Christianity in the 5th century over a disagreement about the nature of Christ. They are not in communion with either Constantinople or Rome. 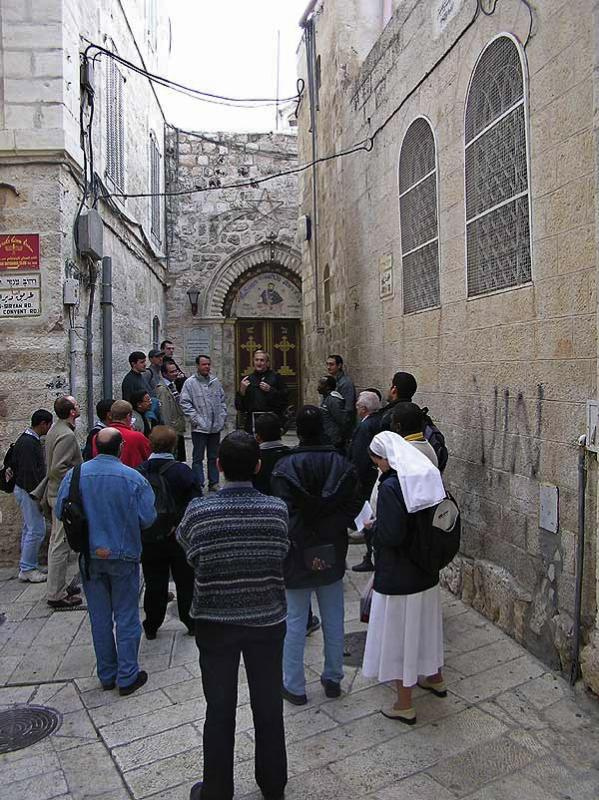 Their community in Jerusalem, centred on the Church of St Mark, numbers only about 600. 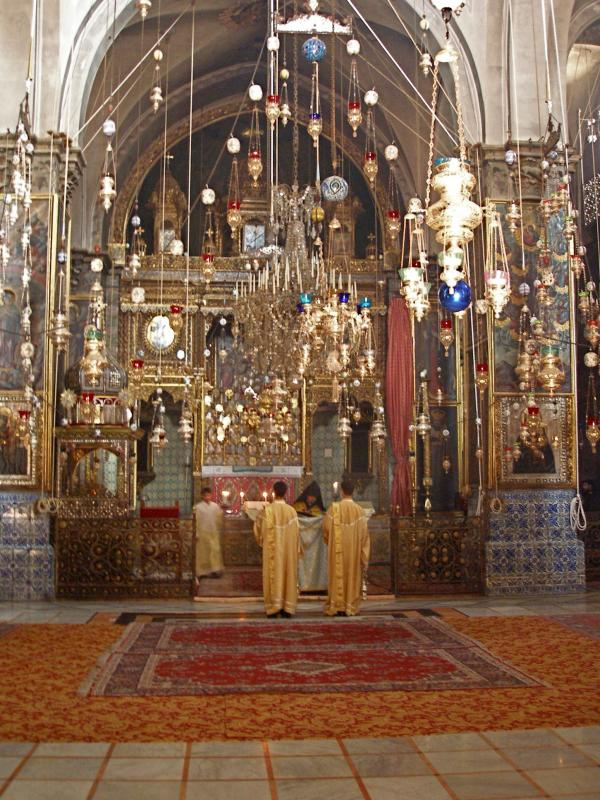 The Syriac Orthodox also worship in the Chapel of St Joseph of Arimathea and St Nicodemus in the Church of the Holy Sepulchre. Jesus shows Thomas the wounds in his hands and side (John 20:24-28). Nestled within a walled compound in the ancient Armenian Quarter of Jerusalem’s Old City, the Church of St James is one of the most ornately decorated places of worship in the Holy Land. This ancient church, part of which dates to AD 420, is the cathedral of the Armenian Orthodox Patriarchate of Jerusalem. Armenia — a land-locked country in south-west Asia — was the first nation to adopt Christianity as its state religion, in AD 301, and Armenian Christians established the first “quarter” in Jerusalem. The Church of St James is dedicated to two martyred saints of that name — St James the Great, one of the first apostles to follow Jesus, and St James the Less, believed to be a close relative of Jesus, who became the first bishop of Jerusalem. St James the Great was beheaded by Herod Agrippa I, grandson of Herod the Great, around AD 44 (Acts 12:1-2). St James the Less was martyred by Temple authorities about 20 years later by being thrown from the Temple platform, then stoned and clubbed to death. According to Armenian tradition, within the church are buried the head of St James the Great (the rest of his body is believed to be in the Spanish pilgrimage shrine of Santiago de Compostela) and the body of St James the Less. Most of the cathedral dates from the 12th century, though it incorporates the remains of two chapels built in the 5th century. This is one of the few remaining Crusader-era churches in the Holy Land to have survived intact. Entry from Armenian Orthodox Patriarchate Road is through a dog-legged porch leading to the church courtyard. Stone crosses (called khatchkars) carved in relief on the walls include early Armenian examples of the so-called Jerusalem cross. The church is open to the public only during services. 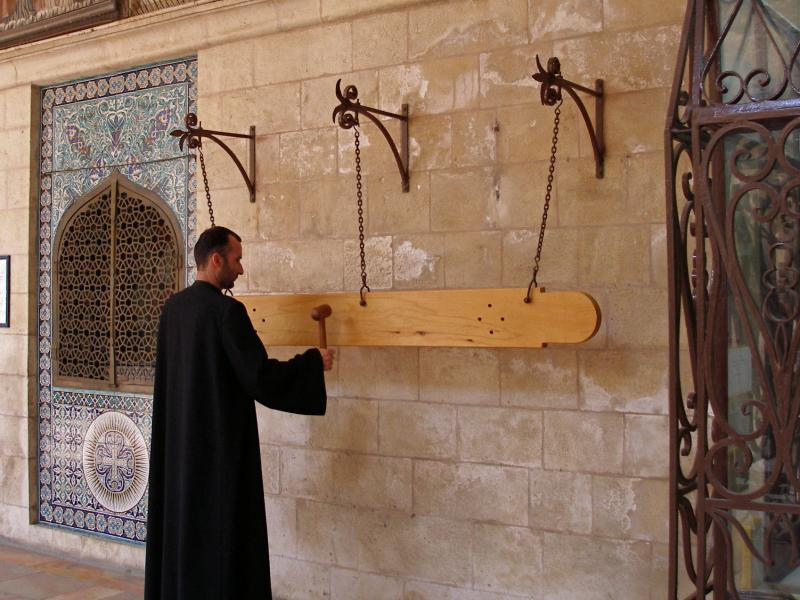 Lengths of wood and brass hanging outside the entrance are hammered with mallets to call the faithful to prayer. Called symandra, they were introduced when a 14th-century Muslim edict forbade churches to ring bells. The interior, under a vaulted dome, offers a splendid spectacle of gilded altars, massive chandeliers, myriad lamps with ceramic eggs attached to them, paintings, carved wood, inlaid mother-of-pearl, bronze engravings, and blue and green wall tiles. The marble floor is usually covered with purple, green and red carpets. Rich vestments, incense and chanting give the cathedral a mystical Eastern character during services. High-set windows, oil lamps and candles are the only light sources, since there is no electricity. Sunlight produces dazzling reflections on the church’s treasures, but cloudy days cloak the interior in darkness. There are no pews. On the left side of the church, opposite one of the four square piers supporting the vaulted ceiling, is its most important shrine, the small Chapel of St James the Great. 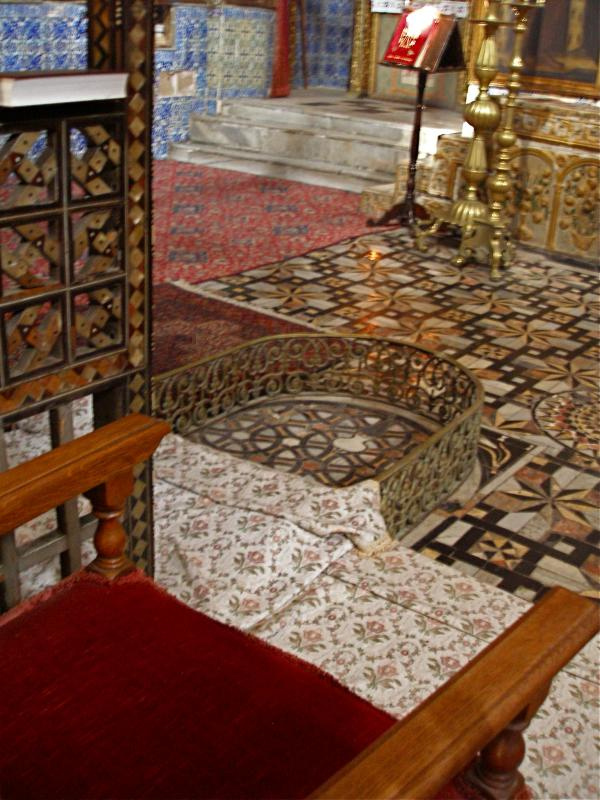 A piece of red marble in front of the altar marks the place where his head is buried, on the reputed site of his beheading. Also on the left side are doors leading to other chapels that are seldom open to visitors. The Chapel of St Menas, an Egyptian martyr (to the left of the Chapel of St James the Great), is the oldest part of the building. Further forward, the Church of St Stephen serves as the cathedral’s sacristy and baptistery. In the front of the cathedral are two thrones. The larger, intricately carved and topped by an onion-shaped baldachino, is dedicated to St James the Less. A low iron grille behind it encloses the saint’s reputed burial place. The smaller throne is the seat of the Armenian Orthodox patriarch. A doorway near the centre of the right-hand wall, also generally closed to the public, was the original 12th-century entrance to the church. It leads to the Etchmiadzin Chapel, formed in the 17th century by blocking a long and narrow portico. The Armenian city of Etchmiadzin (now known as Vagharshapat) is the seat of the Catholicos of All Armenians, head of the Armenian Orthodox Church. Vividly coloured wall tiles in the chapel, illustrating scenes from the Bible and lives of the saints, were made in Turkey in the 18th century for repairs to the Church of the Holy Sepulchre but were not used. The compound of St James Convent, which contains the Church of St James, is like a miniature city with residences for more than 1000 families. Behind its fortress-like walls are the patriarchate, a hospice, living quarters for nuns and priests, a school, social clubs and a printing press — the first in Jerusalem, established in 1833. Across the street from the main gate is an Armenian Orthodox seminary. Some scholars believe this the site of Pilate’s praetorium, formerly the palace of Herod the Great. In that case, the judgement seat where Jesus was condemned (John 19:13) would have been on an open square where the Church of St James now stands. • The Mardigian Museum (open 10am-4.30pm Mon-Sat) contains exhibits on Armenian art, culture and history, with a section devoted to the tragic genocide of perhaps two million Armenians by Ottoman Turks in the early 20th century. • The Gulbenkian Library (open 3.30-6pm Mon-Fri) has more than 100,000 volumes and extensive files of Armenian periodicals and newspapers. An Armenian presence existed in Jerusalem in the first century before Christ. After Armenia became Christian in 301, pilgrims began coming in large numbers. 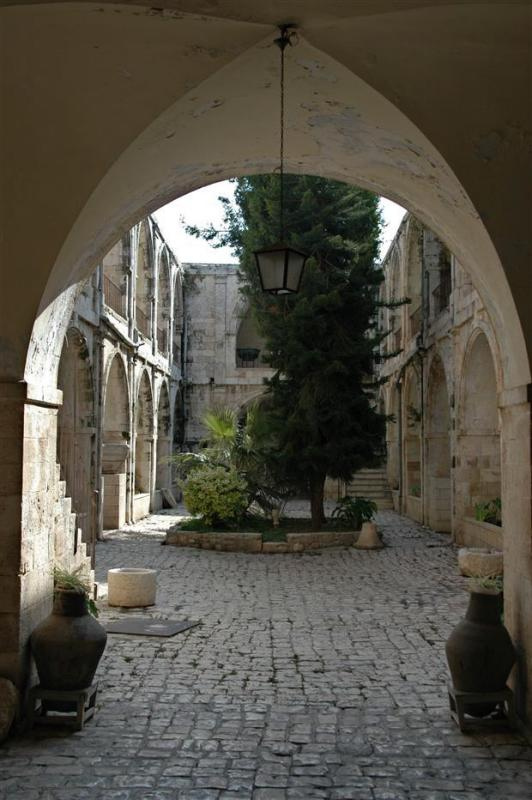 By the 7th century there were 70 Armenian monasteries in Palestine. For several hundred years the Armenian patriarch was considered to be the most senior Christian dignitary in the Holy Land. 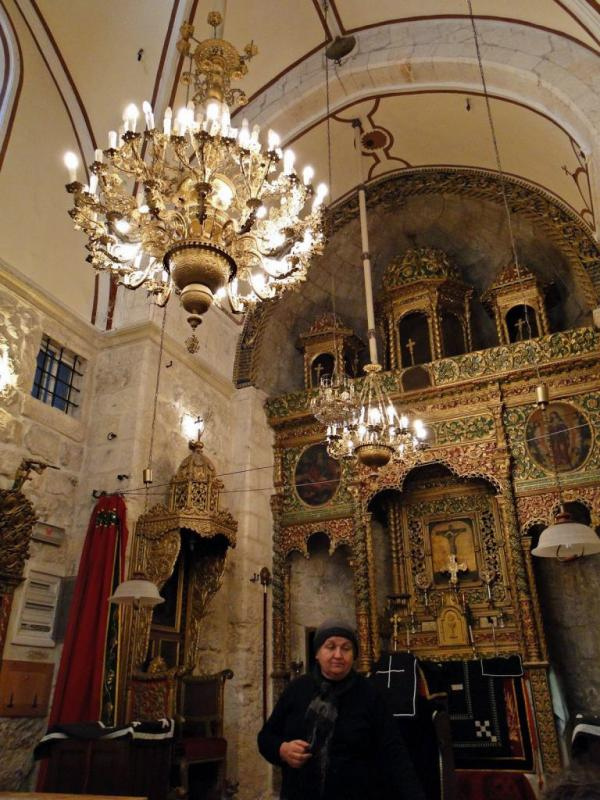 The Armenian Orthodox still have jurisdiction over part of the Church of the Nativity in Bethlehem and also over the Chapel of St Helena in the crypt of the Church of the Holy Sepulchre. The peaked hoods worn by their priests, shaped like the dome of a typical Armenian church, are intended to make the priest look like a walking church in the world. 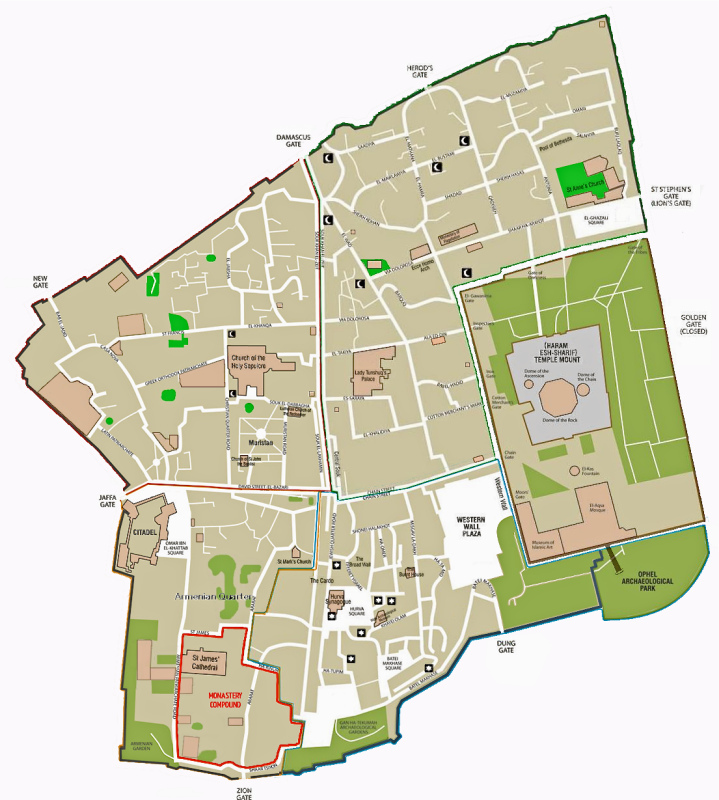 The Armenian Quarter began taking shape in the south-west of Jerusalem before 1100. After expansion of the Jewish Quarter in 1968, it now occupies about one-sixth of the Old City. The Convent of St James takes up two-thirds of the quarter. The remaining third includes churches of four other denominations: Syriac Orthodox, Greek Orthodox, Maronite and Anglican. Open: 6.30-7.30am and 3.00-3.40pm Sun-Fri; 6.30-9.30am and 3.00-3.40pm Sat. Modest dress required. Jerusalem is revered as a holy city by half the human race. For Jews it is the city King David made the capital of his kingdom, and where the Temple stood, containing the Ark of the Covenant. For Christians, it is where Christ died, was buried and rose again, and the birthplace of the Church. The Jewish and Christian Bibles mention Jerusalem several hundred times. For Muslims it is al-Quds (“the Holy”) because they believe Muhammad ascended to heaven from the Temple Mount during his Night Journey. Set on the Judaean mountains of central Israel, the Old City of Jerusalem is surrounded on three sides by steep valleys: The Hinnom on the south and west, the Kidron on the east. Its history lies in layers metres deep. Its iconic symbol, the golden-roofed Dome of the Rock, stands on the Temple Mount, also identified as Mount Moriah, where Abraham prepared to sacrifice his son Isaac. 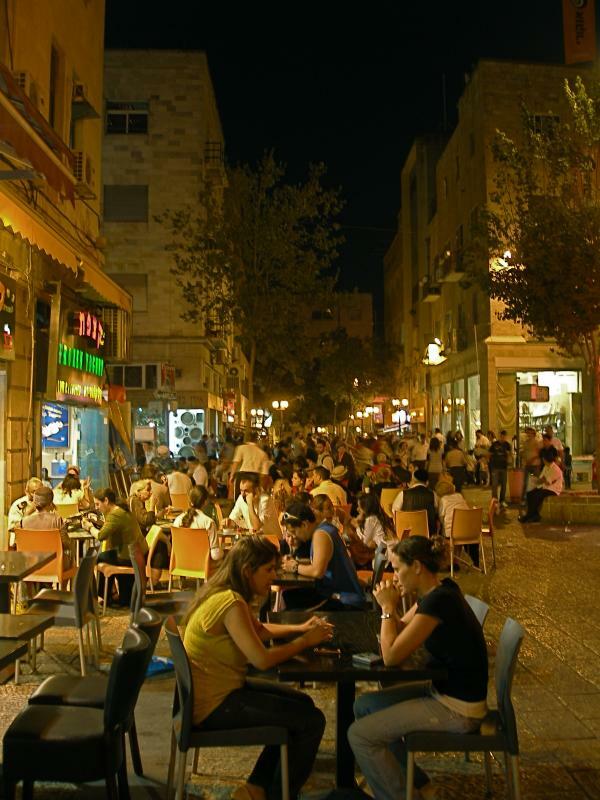 The bustling modern city of Jerusalem, also faced with cream-toned limestone, has spread to the west and north of the Old City. Modern Jerusalem is not a large city by international standards (its population in 2007 was 747,000, of whom 35,400 lived in the Old City). In the time of Christ its population was between 20,000 and 50,000. 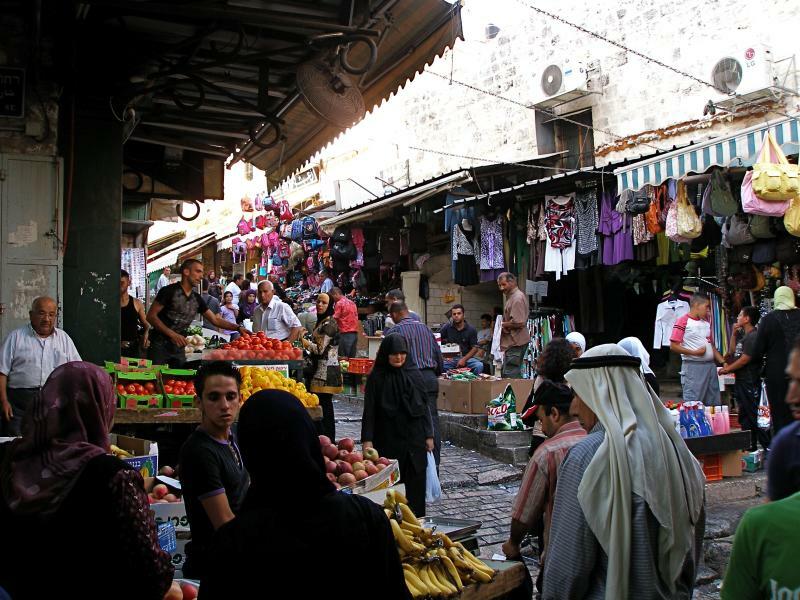 It is a city with an intriguing blend of sights, sounds and smells, especially in the Arab markets of the Old City. The past and present continually rub shoulders. Church bells peal, muezzins call Muslims to prayer, and friars, rabbis and imams hasten by. Reminders of the heritage of three faiths are never far away — Jerusalem has 1200 synagogues, more than 150 churches (representing 17 denominations) and more than 70 mosques. The Israel Museum presents collections of arts and archaeology, including the Shrine of the Book containing Dead Sea Scrolls and an outdoor scale model of Jerusalem in AD 66. Exhibits in the Tower of David Museum depict 4000 years of history. The Yad Vashem complex documents the story of the victims of the Holocaust. At Jerusalem’s heart is the Old City, girded by a wall and divided into four “quarters” — named after the dominant ethnic or religious identity of its residents. Its area is less than a square kilometre, about two-thirds the city’s size in the time of Christ. “Perched on its eternal hills, white and domed and solid, massed together and hooped with high gray walls, the venerable city gleamed in the sun. So small!” wrote Mark Twain in 1869, when settlements outside the walls had just begun to displace shepherds from the Judaean hills. The Muslim Quarter, largest and most populous of the four, includes the Temple Mount with the Dome of the Rock and Al-Aqsa Mosque. Other sites in the quarter include the Pools of Bethesda and part of the Via Dolorosa. 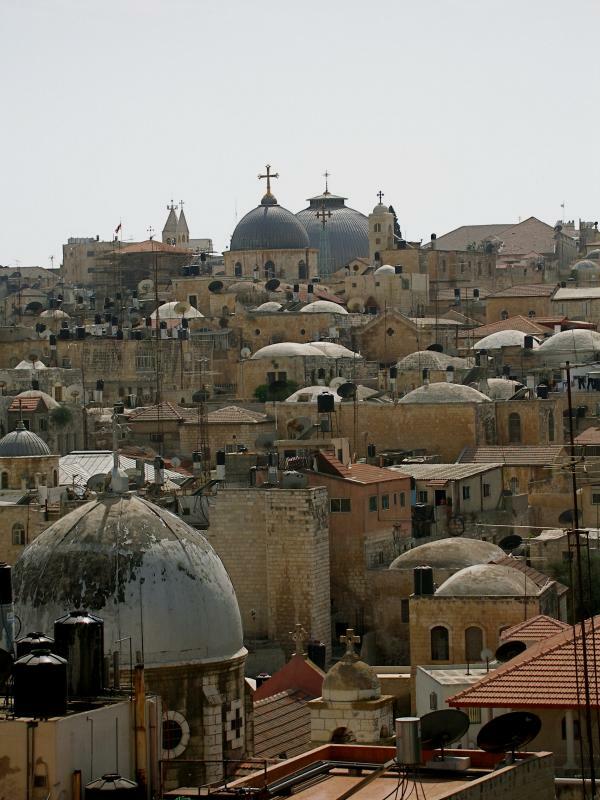 The Christian Quarter contains the rest of the Via Dolorosa and the Church of the Holy Sepulchre, which enshrines the sites of Christ’s death, burial and Resurrection. Headquarters of several Christian denominations are among the 40 religious buildings in the quarter. The Jewish Quarter adjoins the Western Wall, the sole remnant of the Second Temple plaza, which is Judaism’s holiest place. This quarter is more modern, with sophisticated shopping plazas. Archaeological remains are on display in museums and parks. The Armenian Quarter provides a reminder that Armenia was the first country to make Christianity the state religion (in 301). It contains the Armenian Orthodox Cathedral of St James and a museum in memory of the 1915-23 Armenian Holocaust. 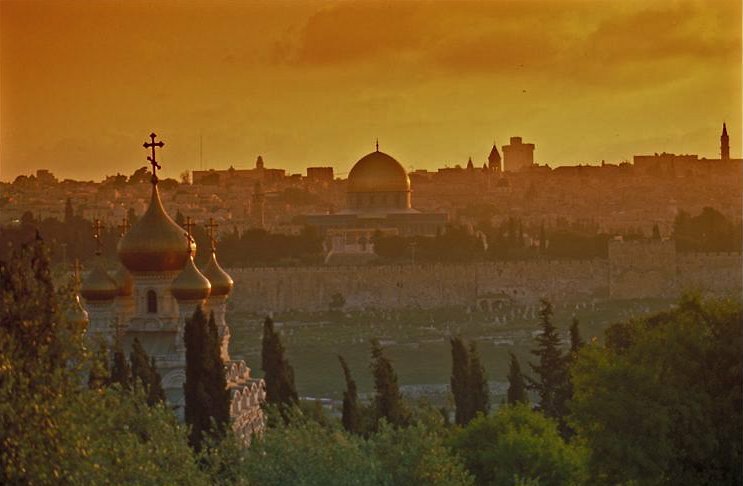 Outside the Old City, to the east is the Mount of Olives, where venerable olive trees still grow in the garden of Gethsemane, the scene of Jesus’ agony the night before he died. 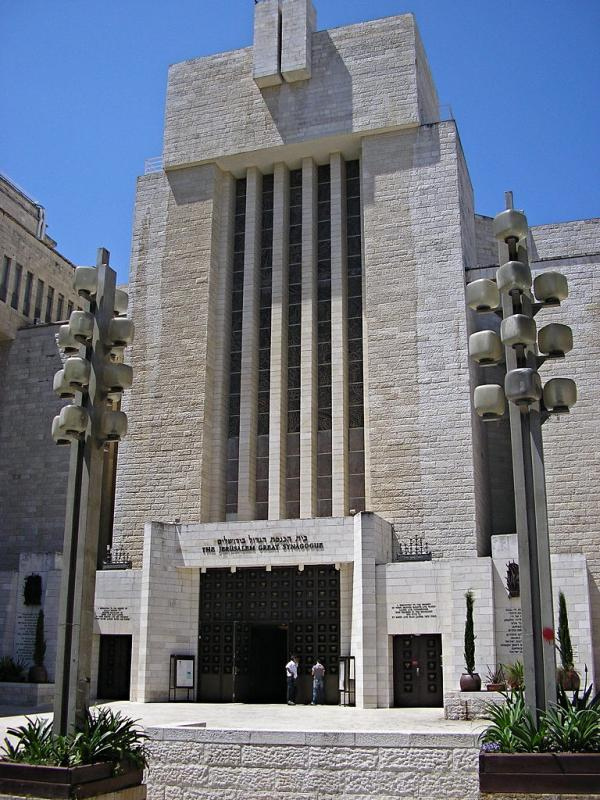 The teardrop Church of Dominus Flevit commemorates the Gospel incident in which Jesus wept over Jerusalem’s future fate. The Church of Pater Noster recalls his teaching of the Lord’s Prayer. 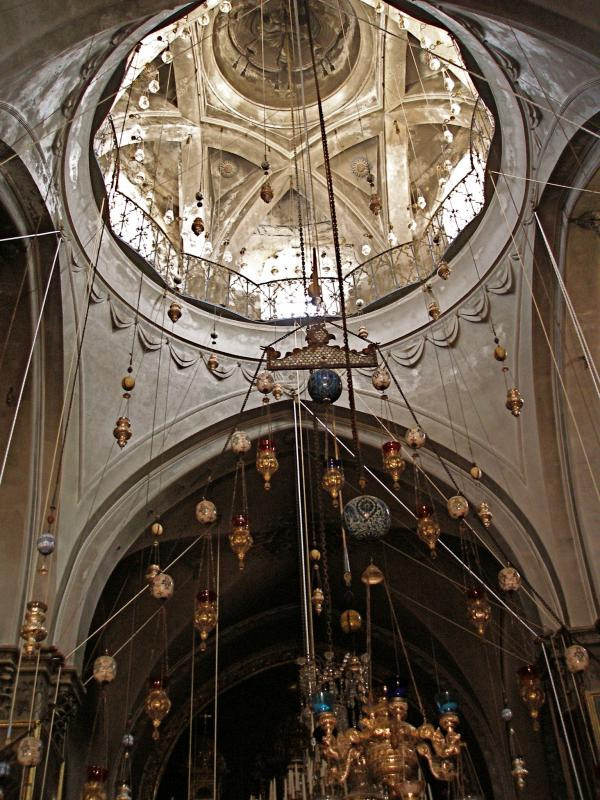 The Dome of the Ascension, now a mosque, marks the place where he is believed to have ascended to heaven. Southwest of the Old City is Mount Zion, the highest point in ancient Jerusalem. 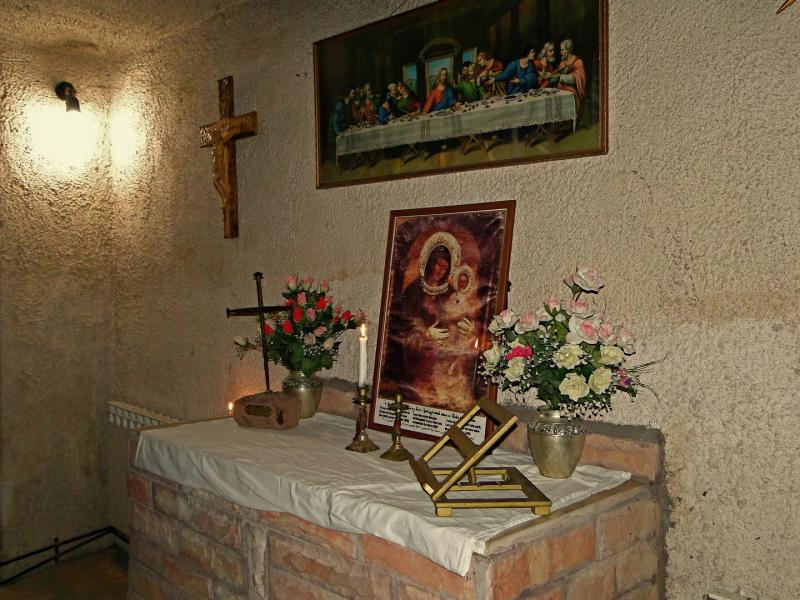 Here is found the Cenacle, believed to be on the site of the Upper Room of the Last Supper. This is also regarded as the site of the Descent of the Holy Spirit at Pentecost and the Council of Jerusalem, where early Church leaders met around AD 50. 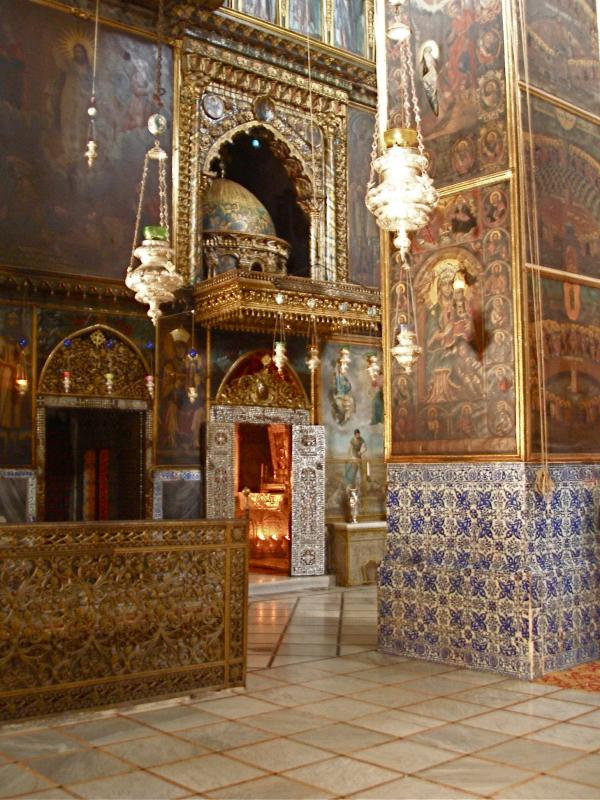 The Church of St Peter in Gallicantu marks Jesus’ appearance before the high priest Caiaphas, and the Church of the Dormition commemorates the “falling asleep” of the Virgin Mary. The earliest reference to Jerusalem suggests that its name means “the foundation of [the Syrian god] Shalem”. A more common interpretation is “city of peace”, but peace has remained an elusive goal for most of the city’s history. Down through the centuries, Jerusalem has been besieged, conquered and destroyed many times. Early settlers called Jebusites lived there around the Gihon Spring when David conquered it around 1000 BC and made it the capital of his kingdom. During Old Testament times the conquerors included Babylonians (who destroyed the First Temple and exiled Jews to Babylon), Persians, Greeks, Syrians and Romans (who in AD 70 destroyed the Second Temple). Since the Christian era began, Jerusalem has been ruled by the Roman Empire (first from Rome, then from Byzantium, now Istanbul), Persians, Arab Muslims, Crusaders, Muslims again, Egyptian Mamelukes, Ottoman Turks and, from 1917 to 1948, the British. After the Arab-Israeli War of 1948, Jerusalem was partitioned between Jordan and the new state of Israel. The Israelis gained control of the predominantly Arab East Jerusalem and Old City during the 1967 Six Day War, but the status of Jerusalem remains a key issue in the ongoing Israeli-Palestinian conflict.